During the month of March, The Tilted Quilt has been hosting the Quilty Bucket List, which is exactly what it sounds like, the quilts that you would want to make in your lifetime. You know, those quilts that you pin on Pinterest and favorite on Flickr and say, "One day I will make that!" Well here is my list! I went through my pins and favorites and compiled a list (in order of to do) of those amazing quilts that I want to make in my lifetime! So join me as I list some amazing quilts and if you click on the photo it will take you to the image source, which in most cases is a blog post about the quilt and maybe even a tutorial of how to make the quilt itself! 1. The Marcelle Medallion Quilt from the book, Liberty Love by Alexia Marcelle Abegg. I've been in love with this quilt since I first saw it, why I haven't already started this one is beyond me, but I think I am just scared I will choose the wrong fabrics. I will make this quilt! There have been many versions of this quilt made already by many others, but I have to say that Hadley's version is my favorite, she nailed it! 2. A Blended Scraps Quilt. Not that long ago, maybe a month or two at most, Leanne blogged about the above quilt and I fell head over heels in love with it! Thankfully for me she just posted the tutorial for Reflection so I can shamelessly copy her version, which I plan to do. There is something about this one that is just so beautiful, great use of color and value, the whole nine yards. 3. A Sampler Quilt. The above is the perfect example of what I am talking about, a quilt that takes a ton of different blocks and fits them all together in one super busy, fun and energetic quilt. I took The Penny Sampler Class by Stitched in Color and plan to combine those blocks with a ton of others to create the perfect sampler quilt. 4. A planned kaleidoscope quilt. In a way sort of like the One Block Wonder Quilt, but instead of just randomly cutting the triangles, you purposely cut them to make very distinct shapes, colors and patterns. The example above is just so beautiful, I mean how could you not want to make this. Oh and be it that I love triangle quilts, this one is right up my alley. 5. An improv quilt. I am going to call this one improv in that I want to make a quilt that starts with a few blocks and then is just randomly built upon until it is done. No real plan, no real structure, something that is totally out of my comfort zone. The quilt above is exactly what I would like to create, a lot of low volume dead space, a few planned blocks, a one of a kind quilt. 6. A modern scrappy crosses quilt. I had pinned a TON of cross quilts, way more than I ever realized, so I went through, picked my favorite image (above) and want to use components of this quilt to create a scrappy cross quilt. There is just something so simplistic about the block itself that lends to so many possibilities. 7. An individual block paper pieced pattern quilt. There are so many out there that I love, The Forest QAL, Sew Out Loud QAL, and pretty much all of the ones by Quiet Play and During Quiet Time. The hard part for me will be choosing which one, heck I spent an hour trying to decide which one I wanted to feature as the photo above. Whew, maybe it is a good thing it is last on my list, I need more time to decide! Well that is it, I am making myself stop at seven, which is pretty funny since originally I thought my list would only include three. So there it is, my quilty bucket list. You can still link up your list over at The Tilted Quilt, and you can stop by and read many others bucket lists also, and what is so neat to me is how varied these lists really are, so go on over and take a look! Every month Kristy over at Hopeful Threads holds a new charitable sewing event. Every month it is a different task ranging from cloth diapers to dresses, all for people in need in other countries. Be it that every month is a new goal and donation, you can join in any time and contribute. 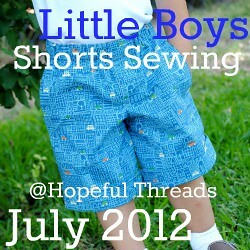 This month (July) all participating are making shorts for boys to send to Children in Families in Cambodia. Since I am surrounded by boys, I figured this would be a great month for me to contribute. Below are the pictures of the two shorts that I am contributing to this goal. Both are 18/24 month size, with a simple elastic waist. Kristy was aiming to have 100 pairs to donate, and as of right now, she already has 200! So awesome! Be sure to head over to Hopeful Threads at the beginning of August to see what Kristy announces as the new event and you too can contribute! The next event is currently ongoing and you can join in right now! 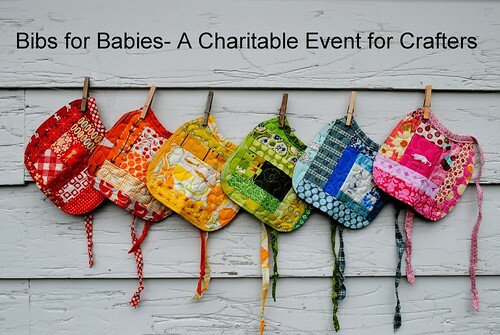 Jessica (Euphoria on Flickr) is hosting Bibs for Babies - A Charitable Event for Crafters. She is asking that you make 2 bibs and send them to her. She in turn will collect them all and donate them to Operation Baby Shower, a 501(c)(3) non-profit organization that provides joyful baby showers for military families to ease the burden of deployment. It is so great to support our military families who are working so hard for our wonderful country. Below are the two wipe-able (protective clear plastic layer on top) bibs that I am donating to this cause. They are backed with terry cloth and feature snap closures for ease of use and it keeps baby from yanking it off, which is a feature that I love when making and buying bibs! All bibs must be mailed by August 31, 2012, so you still have plenty of time to join in! Head over to the Flickr group for more information. Let us pretend that I am a famous blogger, and I get to pick out a bundle of fabrics that will be sold at Fat Quarter Shop...go ahead imagine it. Well here it is! This is what I would pick, and this bundle is so opposite of my style, it isn't even funny, though I do love this bundle and would love all these fabrics, it just isn't me. Why isn't it me? Because If I picked a bundle it would be all rainbows and colorful and basically the vision of "It's a Small World!" I think the majority of you would probably prefer to see a more practical palette, vs. glitter and rainbows galore! I am really trying to broaden my horizons and try new things in the New Year, so I'm starting a bit early with this one. Oh, and there was a point in doing this fun little exercise...there is a competition going on over at Quokka Quilts, so if you would like to see some other great palettes, head over there and check them out! P.S. On a personal note, no baby yet, feeling great and glad to have made it through Christmas without a trip to the hospital! I am currently 36 weeks! Yippee! MAKE! I have quite the list of things I'd like to make, and I'm sure you do to. Now whether or now I will get them Made is a different story, but oh, if I had all the free time in the world, yes, I'd love to make all these projects! Here is my partial list, really this list is things that I have run across this week that I HAVE TO MAKE NOW. The first, a super cute table runner made by Aneela Hoey (of Sherbet Pip fame.) I love the simplicity of this table runner, and the fact that it can be used for many months! To read her blog post about it, click on the photo above. The pattern for this project can be found HERE. I REALLY want to make this one! Though I am not usually a fan of holiday quilts (other than Christmas) this one is simply stunning. I think it is the shade darker sashing used on this quilt that really makes it pop for me. Love it. The pattern is Swoon by Camille Roskelley and can be found HERE. This quilt is made by Amanda Jennings and you can read her blog post about it HERE. Simply stunning. 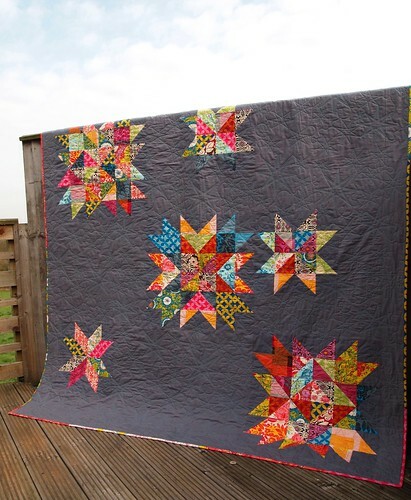 I am really considering using my Scrapbuster Swap scrappy depression blocks to make a quilt like this beauty. The pattern can be found in Issue #5 of Fat Quarterly, and the quilt is designed by Katy of imagingermonkey, you can find her blog post HERE. I kinda think this quilt speaks for itself! 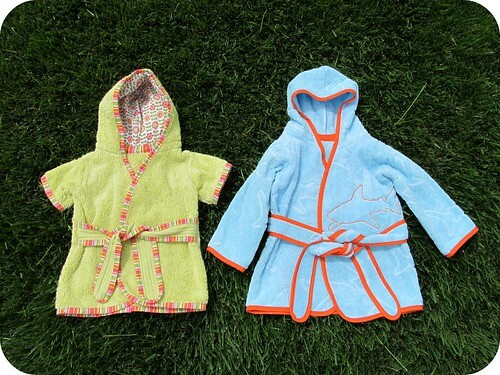 Last, but certainly not least, these ADORABLE beach towel robes. The pattern is from MADE and can be found HERE. These two robes were made my Jill at homemadebyjill, and you can read her blog post about them HERE. I have a confession to make, I bought this pattern last week, and have already whipped up one of these babies, and let me tell you, the pattern is SO EASY and the end result is SO CUTE! I'll be sharing my creation soon! Do tell, what is on your "Things I'd Love to Make!" list?